At DoulaVersity we know that you have many options when it comes to pursuing your doula certification program. 1. Get started with your doula training minutes after you register! No waiting for a manual in the mail, it’s online and waiting for you. Once you register, you will get an email and all you have to do is click a button and you will have immediate access to your online training! DoulaVersity students do NOT have to attend a doula training workshop first – and in fact we ask students to complete modules 1-5 before attending a doula training workshop, if they plan to attend one at all. 2. Attend a workshop when you can - if you can (but it's not required)! We think our doulas will benefit tremendously from attending one of our doula training workshops. However, for some it just isn’t feasible. We get that. We do not make it a requirement. Our online labor doula training will provide you with enough videos, pictures and written instruction that you will feel like you have attended the workshop in person! However, each doula package that we provide gives students a certain amount of time to attend one of our trainings within a certain amount of time – and we encourage you to join us! The Basic Doula Package – allows students up to two years to attend a training from the day of their enrollment. The Business Starter Package – allows one free pass for up to five years (providing they are in good standing and currently training or certified with DoulaVersity). The DoulaVersity Professional Package – allows UNLIMITED passes for LIFE on our doula training workshops. 3. We have more certifications and training's coming! Become well versed in breastfeeding basics– through our Breastfeeding 101 for birth professionals (plans for an advanced breastfeeding 102 as well)! Finally, down the road, we have a training that is unprecedented among doula organizations. Obviously, we will keep it under wraps to torture you until we are ready to roll it out – but it’s going to be a very unique and specialized training that will make you stand out even more against your peers! Ideas on how to facilitate prenatal and postpartum visits - you will know what to cover and how to facilitate those meetings! Pregnancy - learn about the growing baby and the mother. Everything from growth to prenatal tests and procedures along with their benefits and risks. All about labor and birth: Everything you need to know from stages of labor to medications. Comfort measures and optimum fetal positioning – Skills to help your client have an easier birth. The postpartum mother: Understanding the emotional and physiological changes in the first hours to the first few weeks after birth. Plus an intro to helping the mother latch her newborn immediately after the birth. Newborn basics: Getting to know the newborn - from normal rashes to newborn tests and procedures. You will learn how to support clients in every birth setting (home to hospital). Our doulas will learn how to provide non-judgmental support in every type of birth from unmedicated to an elective cesarean. The above list is NOT exhaustive, and doesn’t even list the sub-topics! Students will learn as they read through all 15 modules, and reinforce learning through mock email scenarios, quizzes, essays and more. Not to mention the required Spinning Babies Parent Class, and other requirements that will arm our doulas with knowledge and confidence by the time they are certified. We are right here with you! Both Trisha and Christy, the founder and co-founders of DoulaVersity, are right here with you each step of the way. Students have access to our private Facebook mentoring group, and of course we are always just an email away as well! As we grow, you will be assigned your personal mentor to help you get through your training. We want to watch you grow and succeed! 6. Already trained as a doula? Do you feel like your doula training left you a little confused or lacking in a certain area – OR – do you just want to add to your knowledge and skills? 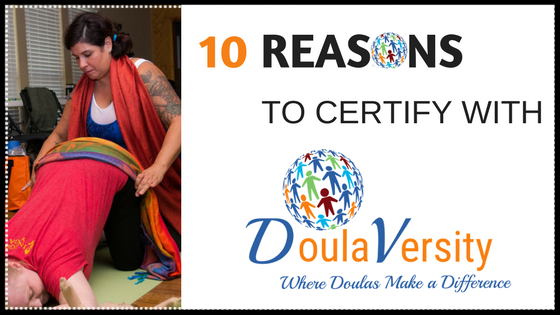 It’s easy to cross-certify with DoulaVersity! We are confident you will learn a ton of new things when you train with us! You will also get the discounts on all the other trainings and certifications as we roll them out. Besides all that, you have the option of attending one of our awesome doula training workshops – and let’s face it, they are always fun and informative! You will build your worth as a doula because it looks good on your doula resume when you add to your skill set. Your clients will thank you! We give you plenty of time to get certified. We give students access to our online doula training for 2 years. If life gets in the way, and you need more time – all you have to do is ask! We will extend out your training one more year – free of charge. 8. We give you more than a training - we give you stuff too! Even the basic doula package includes a listing on our ‘find a doula’ website to help get your name out there to potential clients. The Spinning Babies Parent class, although required will give you a head start on an advanced set of skills that some doulas never learn. Plus six months video access to quality, evidenced based pregnancy, birth, postpartum and newborn information. Other packages include even more - from labor tool kits, tote bags, t-shirts, consultations via phone and Skype with a doula trainer, handouts, contract samples, birth planning activity cards, and our soon to be famous birth doula reference cards - we have STUFF packaged in with our doula packages. Choose the package that best suits your business starting needs! 9. You can live anywhere in the world and become certified! You don’t have to live in Fort Worth, Texas to become certified. We are an international doula organization and we look forward to training doulas all around the globe. Eventually, we will have our trainings available in several different languages. Yeah, we plan to make a WORLD of difference! We do require recertification every three years – but we make it easy and have three options! Recertification gives your clients the peace of mind that you are continually learning and updating your skill set. There is always something to be learned, and evidenced based birth practices are continually updated. Students have the option to break up the payments into $50 a year. We also offer a $25 credit towards yourrecertification for every student you refer who enrolls with us! Your recertification fees can easily pay for itself in this way! We look forward to helping you build your doula career! Sign up today!